If you are interested in a bit of history or just want to visit a quite unique city, it is worth stopping off in Stone Town for the architecture and the laid back hustle and bustle. Once the capital of the east African slave and spice trades and ruled by the Sultans of Oman, today Stone Town is a vibrant mix of new and old. Despite the tumble-down apperance of much of the town, there are some exquisite hotels and wonderful aromas and flavours. Rooftop sundown drinks and nibbles at the night food market are a must. Again, there is a range of accommodation available. 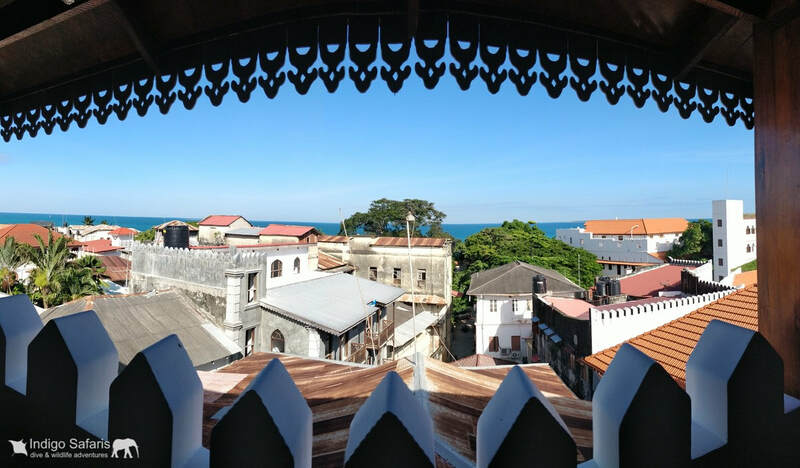 Stone Town is a UNESCO World Heritage Site, the heady scent of spices and multi-cultural history suffuses narrow streets full of the hustle and bustle of daily life, fish and spice markets, mosques, the old Omani fort and the Sultan’s palace. 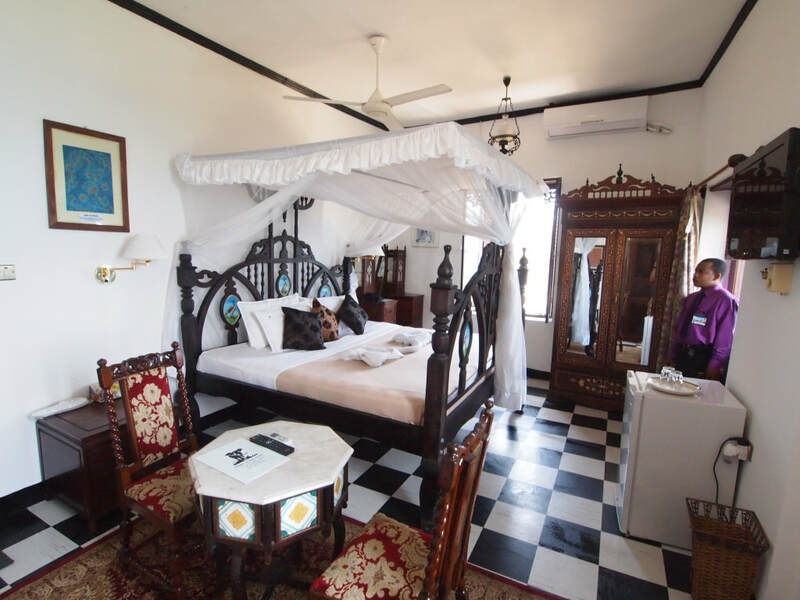 Exotic, charming, beautiful and small enough to explore mostly on foot Stone Town is an ideal base for a longer trip to explore the islands of Zanzibar or spend several days here to unwind and soak up the atmosphere. 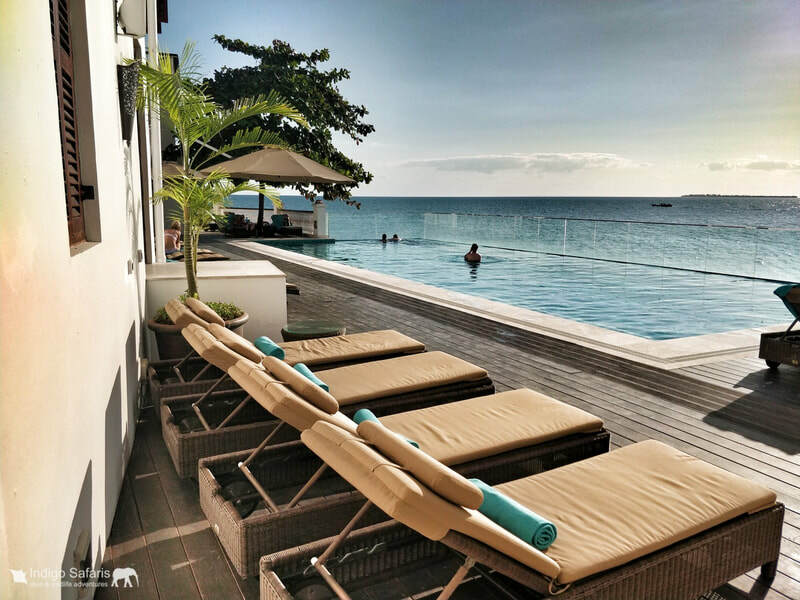 Emerson Spice Hotel: for those seeking true romance, opulence, something exotic and the best 360 degree birds-eye view of Stone Town, then nowhere can beat the newly opened Emerson Spice Hotel which has to be one of the most chic hotels in East Africa. Owned and renovated by the famous Emerson himself (he is one of Stone Town’s longstanding ex-pat residents, and co-founder of the renowned Emerson & Green Hotel, with many a tale to tell over a sunset cocktail, probably the strongest G & T you will try in Zanzibar), the hotel has exclusive individually styled suites and offers fine rooftop dining. 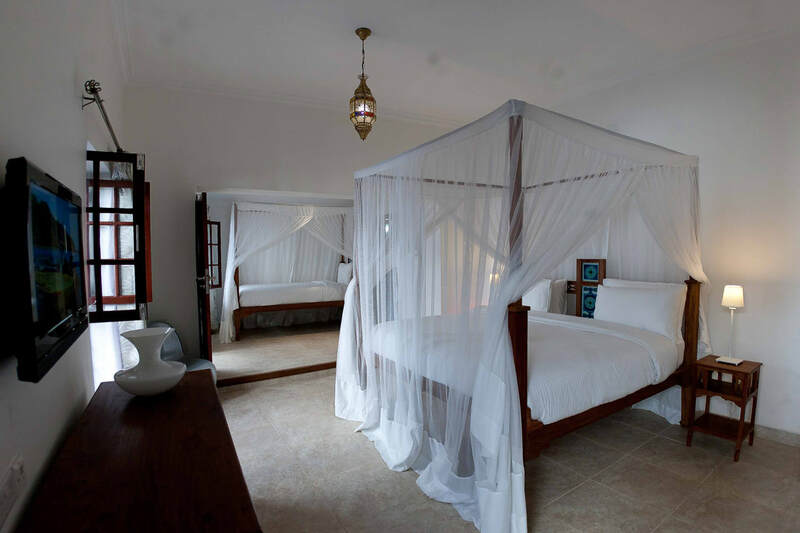 Each of the suites is uniquely decorated following different themes and every room has a beautiful Zanzibari bed, huge bath, balconies and stylish touches. There are currently nine completed suites (there will be 12) – stay now before it gets booked up by celebrities as Matt Damon and Juliette Binoche have already visited. Dinner is served on the rooftop every evening and is a six-course menu of exquisite petite dishes. Zanzibari seafood, spices and fruit play central roles with menus including tambi prawns with grilled mango, passion fruit ceviche, coconut fish, squid ink risotto, lemongrass calamari with black pepper banana and sorbets of custard apple with saffron and mango with cardamom. Dinner is prepared and served on the roof by excellent staff and is a bargain at $30. Room Rates: $175 to $250 per room per night with breakfast. 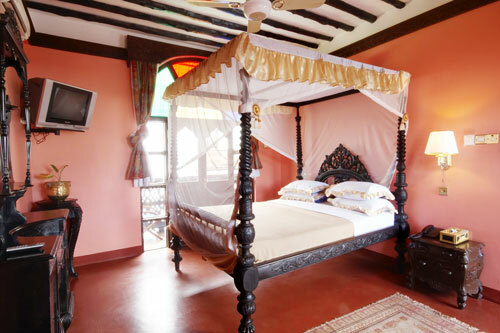 Set in the heart of the UNESCO world heritage site of Stone Town behind the House of Wonders; Maru Maru is just a few steps from the city’s historical attractions, colourful markets and labyrinth of shops. 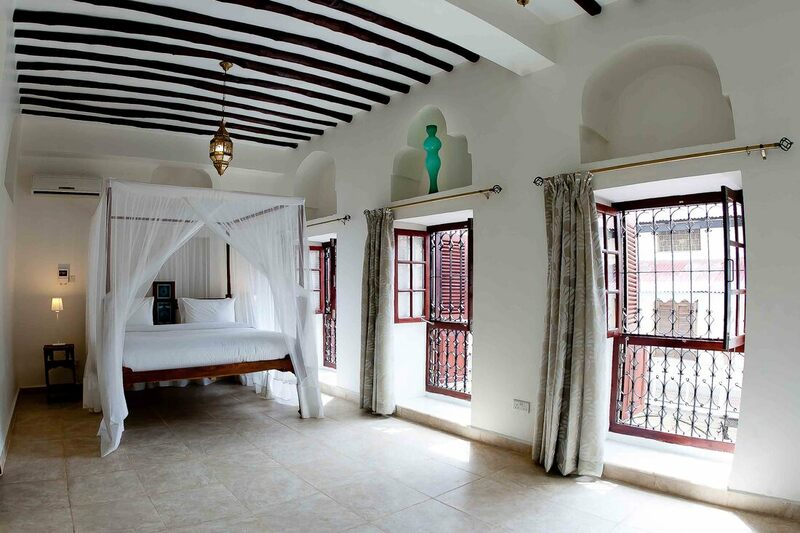 Once a town house famous for its marble floors and tiles, it was recently lovingly restored to offer 44 bright rooms blending classic Zanzibar style with iconic design and modern luxuries. Its roof terrace offers one of the best views in the city with a 360° panorama and is the perfect place to enjoy a drink as the sun melts into the Indian Ocean. Combined with the 4 pm to 7 pm happy hours it’s worth a visit for the sunset views alone. The restaurant serves a mixture of Zanzibari, Indian, and western cuisine dishes. Four star accommodation at three star prices. With a superb location on the seafront, a quiet infinity pool and some of the best food in town, The Park Hyatt is a great choice for relaxing in the sun during the day and with a sundowner or two in the evening. Located in a great position on the beach yet close to all the central attractions in the centre of the town. 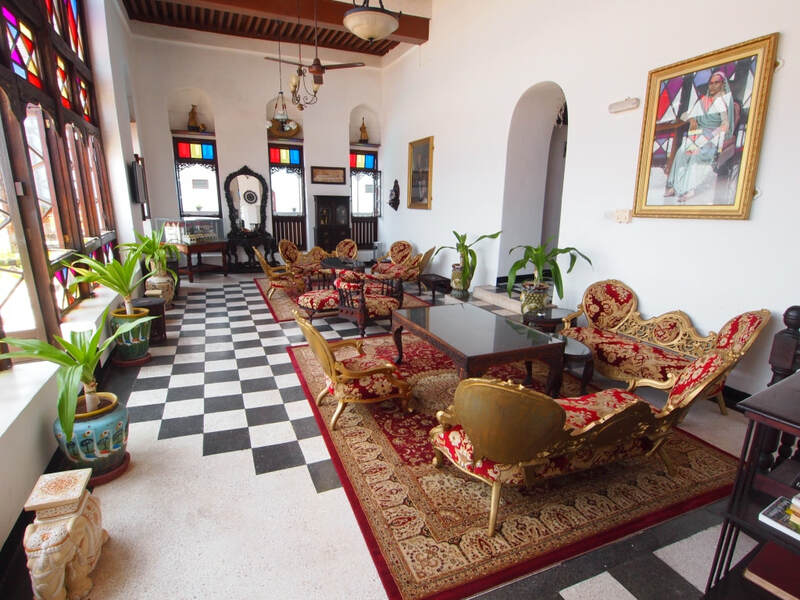 It has an African Colonial feel and is an historic hotel which was the American Consulate in Zanzibar (1834-1884) then the trading offices of Cowasjee Dinshaw & Partners. Mahatma Ghandi stayed here in 1930, whilst as a rising new star Freddie Mercury and his family frequently retreated to what is now the “Marashi” apartment. Next to Tembo House Hotel is what used to be the British Consulate, where in 1874, Dr. Livingstone’s body was brought before its long journey back to England.The Tembo does not serve alcoholic drinks, though the bar next door does. Room rates with breakfast from: $140 prime double with sea or pool view, $170 for a deluxe suite. $170 for a triple, $110 for a single. The Dhow, being the heart beat of the East African culture, has been carrying people, goods and treasures to and from Zanzibar for hundreds of years. Today, the Dhow Palace serves as a meeting point for people and cultures from all over the world amidst a decor and artifacts from a time gone by. Dhow Palace was originally the home of a rich merchant, Sheikh bin Mujbia. Bin Mujbia and his descendants kept the building for more than three centuries before it was sold. 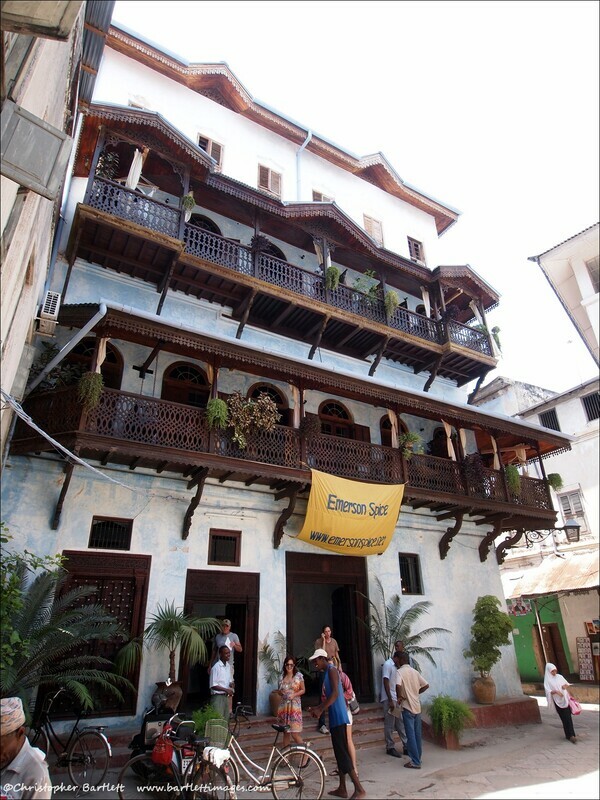 The Dhow Palace building, being right in the heart of Stone Town, has bore witness to many events taking place in Zanzibar. The Dhow Palace does not serve alcoholic beverages. Room Rates from: $80 singles, $110 double or twin suites, $120 deluxe double suite, $150 Presidential suite including breakfast. The House of Wonders (or "Palace of Wonders", also known as "Beit-al-Ajaib") its interior has been dedicated to a museum on Swahili and Zanzibar culture. The Old Fort ("Ngome Kongwe" in Swahili), adjacent to the House of Wonders, is a heavy stone fortress that was built in the 17th century by the Omanis. The Old Dispensary (or "Ithnashiri Dispensary")was built from 1887 to 1894 to serve as a charity hospital for the poor, but was later used as a dispensary. The Palace Museum (also known as the "Sultan's Palace", "Beit el-Sahel" in Arab) is another former sultan's palace, also located on the seafront, to the north of the House of Wonders. The Anglican cathedral of Christ Church or the Roman Catholic cathedral of St. Joseph. The High Court of Justice in Kaunda Road designed by British architect J. H. Sinclair. The Aga Khan Mosque is a large mosque with an architecture that combines Islamic and gothic elements. The Forodhani Gardens. The Darajani Market is the main bazaar of Zanzibar. The so-called "Big Tree" is an old and massive landmark fig tree. ​ Prison Island is a small island offshore Stone Town with a small colony of Aldabra Giant Tortoises.